Elena Sophocleous Toth, mastermind behind the quite useful WineriesCyprus.com, was kind enough to participate in the blog's Case of Questions. I wrote a very short profile of the service a few months ago and reached out to Elena to gauge her interest in participating. Voila the result. EST: I think when starting to explore Stockholm's many fabulous fine-dining restaurants in my mid-twenties I started to speak a special dialect of French involving bouquet and tannins. EST: Currently into local wines. Not sure Cyprus counts as a region though? [Editor's Note: Of course!] France otherwise. No specific region in mind. EST: Awesome red with red meat and nice white/rose with seafood/fish/white meat That's how far my food-wine pairing skills stretch. Let me get back [to you] in 10 years. EST: Recognition locally and worldwide. The “buy local” trend can help increase sales of our great local wines. Cooperation between wineries are truly great initiatives such as for filling international demands as embraced by beautiful Mrs Olivia Haggipavlu @ ETKO. 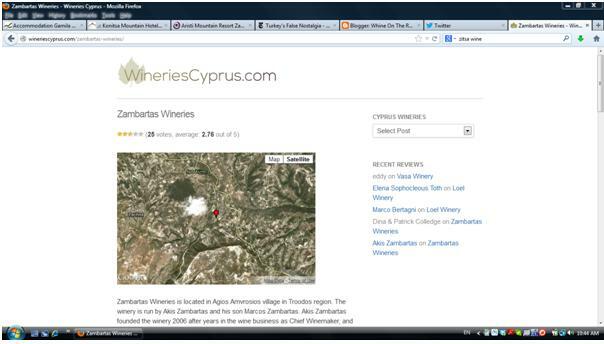 What do you foresee for Cyprus's wine industry? What do you enjoy most about your work in the wine world? EST: My wine work consists of enjoying lovely wine with fantastic people. No more. What is your "Five Year Plan" for your business? EST: Keeping the service up-to-date, useful and perhaps market it more. EST: Marcos Zambartas, the humble star (besides his father) of Zambartas Wineries. EST: Thinking of some jewels from Zambartas or Kyperounta. 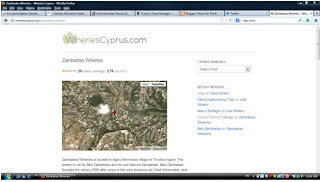 For more information, you can reach WineriesCyprus.com here.